Bel's Fish Bowl: Can you commit????? 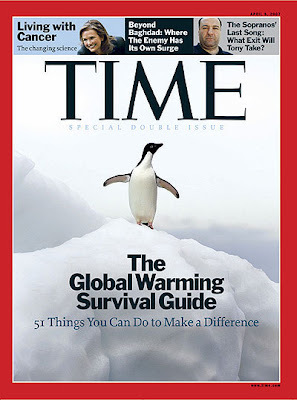 Spent my morning coffee time flicking through the latest issue of Time Magazine, which I was really keen to read for its article on "51 Things We Can Do (to slow global warming)".....because if we don't do it, no-one else is going to do it for us. 1. Change your lightbulbs......to Compact Fluorescent Lightbulbs (CFLs) - they're more expensive than standard bulbs but they use 75% less energy and last (years) longer. CFL's are swirly light bulbs that fit into standard sockets. The Result: Reduce the CO2 created by laundry by up to 90%. 3. Ride the bus....transport accounts for 14% of global greenhouse-gas emissions. According to a US study, if every US home viewed and paid its bills online, solid waste (paper etc) would be cut by 1.45 billion tons a year, and greenhouse-gas emissions would be curbed by 1.9 million tons a year. 5. Open a window......instead of running the air con. 6. Skip the steak.......the international meat industry generates about 18% of the world's greenhouse-gas emissions. So if you've ever considered vegetarianism, now's the time to give it a try! 7. Just say no to plastic bags.......more than 500 billion plastic bags are distributed annually, and less than 3% are recycled! There are now so many other options, the only trick is remembering to take those options with you on your shopping trips! I'll post Part 2 tomorrow.................heaps more ideas! 1. All the lightings in my apartment are new since I just moved in 1-1/2 year ago. The next time I buy replacements, I will get the energy efficient ones. 2. I already pay all my utilities via e-transactions. 3. I love meat (burgers) too much to be vegetarian but I will try to cut my meat consumption by 50%. Portabello mushroom burger, anyone? 4. I will start washing in cold water since my clothes are almost always very clean. 5. I live in NYC and I use the subway. I take a taxi like 4 times a year. don't own a car. Instead I walk or ride my bike for local trips, or for longer trips or weekends away I use my carshare car (flexicar.com.au). Actually this carsharing thing is a super idea. You pay $50 to join (in the case of flexicar). Then you pay around 8-10 bucks per hour to rent the car. Book online. Availability is great. Petrol ( What North Americans call 'gas') is included, as is insurance. No more to pay. They have around 40 cars in inner-city Melbourne and has recently established in Sydney as well. The cars each have their own dedicated parking spot, where they 'live' while not being rented. they say that each carshare car replaces SEVEN cars that otherwise would be out there, taking parking spots and simply having to be built. It's a really smart idea especially if you don't need a car on a daily basis. OH and I take public transport to go downtown. It's just 3 stops away. Here we have a good train network, as well as trams and (tho no one uses them) buses. I just wish everyone would quit talking about global warming. Its been freezing this year. Hi Tanya - thanks for your comment, but I hope your wish that everyone would stop talking about global warming doesn't come true! It's taken too long already for people to START talking about it! Global warming actually effects all our weather patterns, it doesn't just make it hotter. It throws everything out of whack, so is also the reason behind the "freezing" year. So maybe it is worth you talking and thinking about it after all?? all my lights at home are the energy savings one. it depends on your providers etc, i opt for auto deduction, so my bills that come do not even come with reply envelopes anymore. so they save on paper too. dun own a car, so public transport is the way to go! I have a bone to pick with you!! After reading your blog, I started washing my laundry with COLD water for about a month and a half. My towels didn't come out smelling very clean. Initially, I thought it was just the water or detergent but I think it's the cold water. To make up for it, I will start taking colder showers.